With the endo side drop, you rely on your front wheel to swing your weight over the gap at a controlled pace and amplitude before the actual drop. 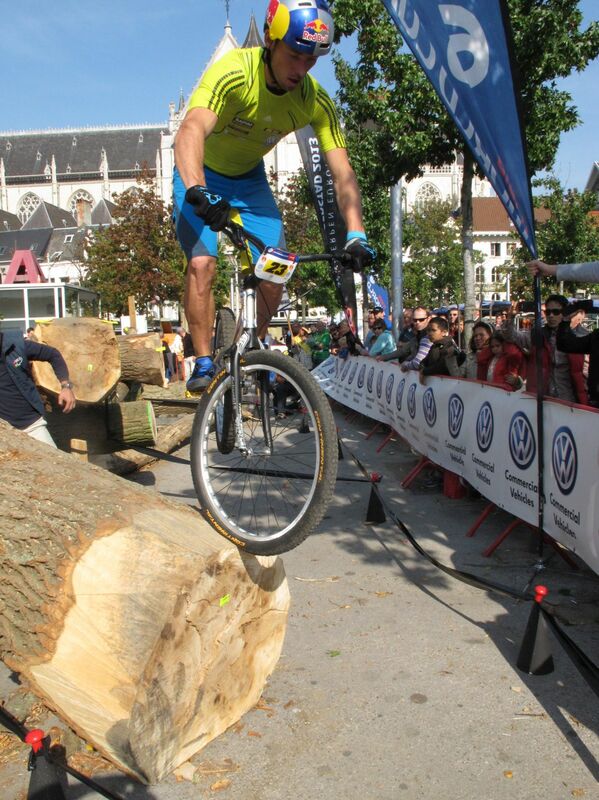 It comes in handy in biketrials competitions, were nothing is quite square like in urban trials. Again, this technique doesn't require much balance, you will only need to stop along the edge you want to leave, and do a small endo (rocking the bike over its front wheel). Although you should practise on both sides to feel at ease in any situations, it is usually easier to perform the endo side drop on your front foot side. Kenny Belaey gets off a wood log sideways. Get as close as you can to the edge, on the side you want to drop-off, your front foot over the gap. With both brakes locked, lean forward using body language and lock your arms to launch a small endo. As you push on the handlebars to lift the rear wheel, swing your hips to skew the endo sideways over the gap, pivoting slightly on the front wheel. When the back wheel is hovering over the gap, clear from the edge, perform a quick push-up on the bars to hop the front tyre off the edge. Make sure to pull the front wheel away from the obstacle. Simple and precise even for the smallest steps. 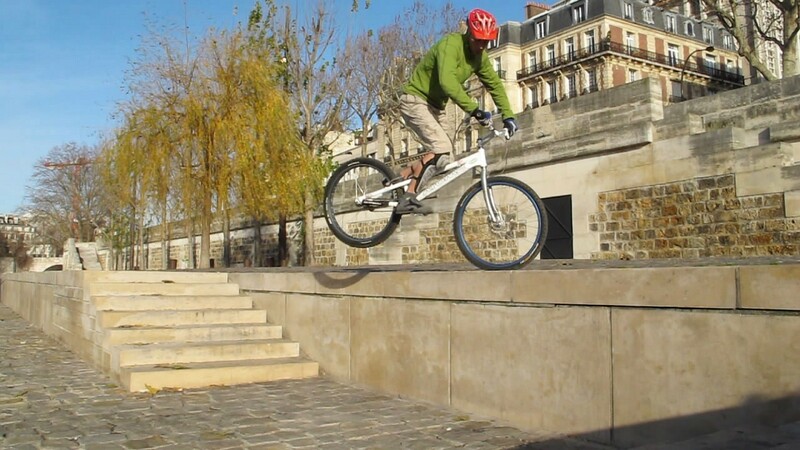 This firm hop sends you off the edge, now pull the bike sideways to realign it parallel to the obstacle. Only when both wheels are cleared, let the rear wheel drop first by extending your arms down. Land in line with the bike, otherwise you may be thrown off-balance upon landing. Keep your brakes locked as the rear wheel touches down. 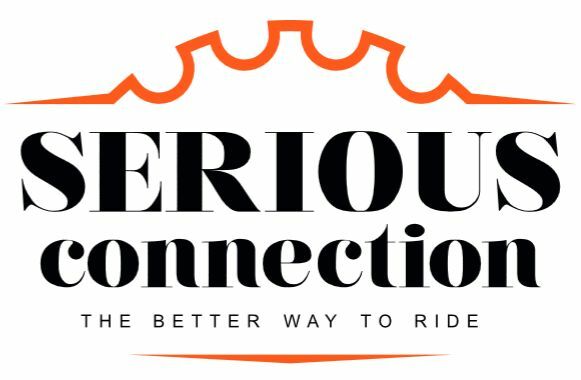 Crouch progressively to absorb most of the impact on the rear tyre and hang firmly to the handlebars to control how fast the front wheel drops down to the ground. 1° Get as close as you can to the edge, on the side you want to drop-off, your front foot over the gap. Lean forward and lock the front wheel. 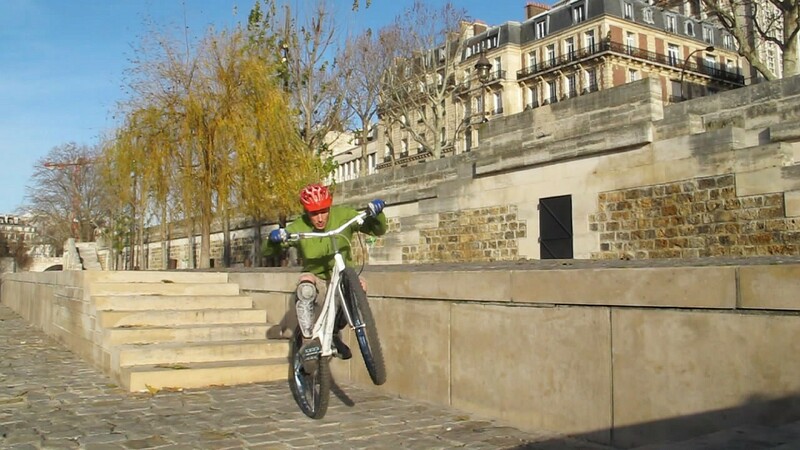 2° As you push on the handlebars to lift the rear wheel, swing your hips to skew the endo sideways over the gap. 3° When the back wheel is hovering over the gap, clear from the edge, perform a quick push-up on the bars to hop the front tyre off the edge. 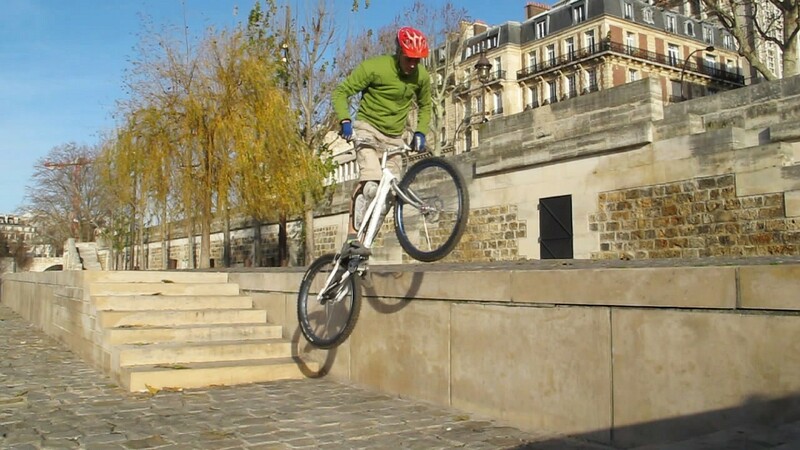 4° This firm hop sends you off the edge, now pull the bike sideways to realign it parallel to the obstacle. 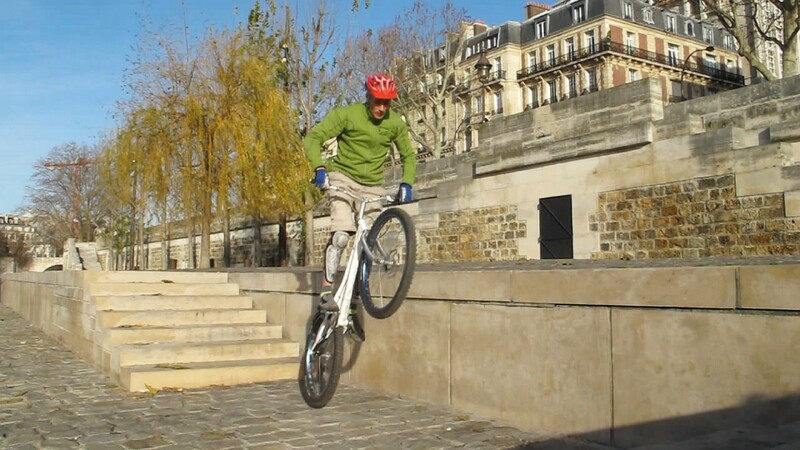 5° Only when both wheels have cleared the obstacle, let the rear wheel drop beneath you and land in line with the bike. 6° Keep your brakes locked as the rear wheel touches down. Crouch progressively to absorb most of the impact on the rear tyre. 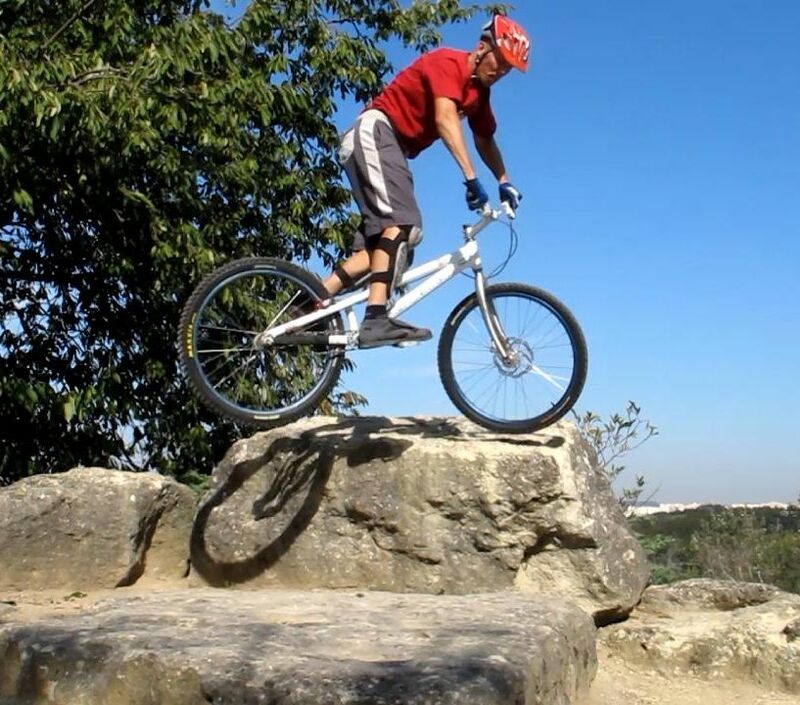 A common mistake is to wait until the rear wheel has started to "sink" on the side of the obstacle. This makes it more difficult to hop as the front tyre gets hooked to the edge, a sure way to crash on your back. 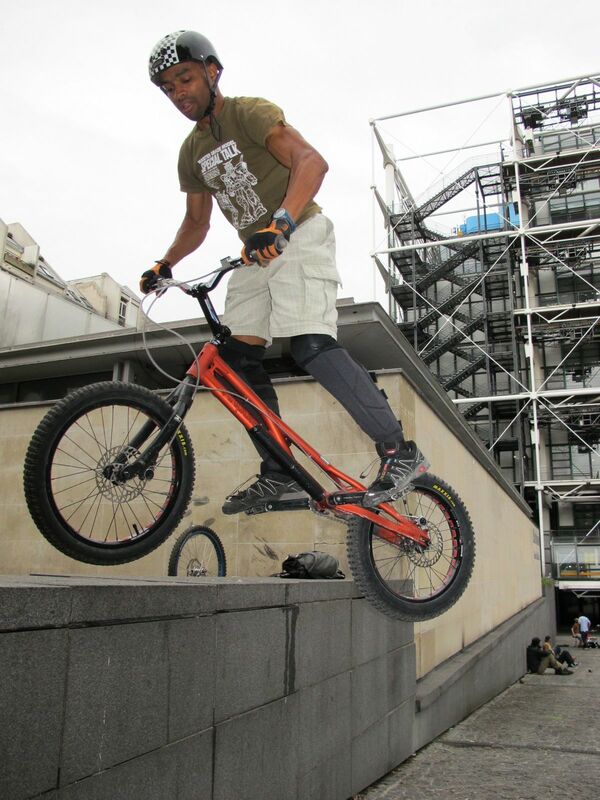 Nicolas Agyemang pulls off the front wheel. In mid-air stabilise the bike in alignment with your upper body, otherwise you're likely to be ejected sideways upon impact with the ground. Let the back wheel hit the ground first, with the rear brake "on" to gain extra damping power. Use the flex of your legs to absorb most of the impact, lower the front wheel to the ground by stretching your arms progressively. Here again, fat low-pressure tyres are more comfortable. If you are confident about pivoting on the front wheel, you can push the endo side drop to 90° or more on the front wheel. Then you will hop and complete the turn in mid-air to land at 180 or 270 degrees from your initial position on the obstacle. This technique could be used to re-position yourself as you drop, but this is mostly a neat trick to show off at demos, launching a 360° endo drop from facing a gap.